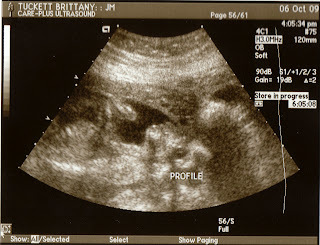 The Tuckett Family: Ultra sound pics! 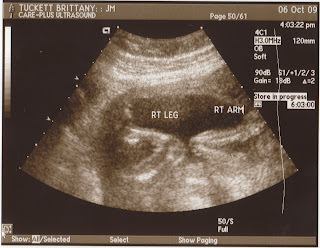 Here are the ultrasound pics of our baby girl! I tried to eat something sweet before so that baby would be active. She was the opposite of active...she was asleep! How rude! The ultrasound tech measured everything and she looked good! She weighs about 13 oz. right now. Enjoy! If you can tell that this is a girl, then you are smarter than me. I just know that it doesn't have what boys have. 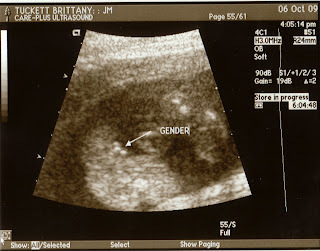 The ultrasound tech was 100% sure that it is a girl! Not a very good picture of it though! This is the foot. I hope that she has very chubby feet! I love chubby babies! This is kind of an interesting picture of the leg and arm. 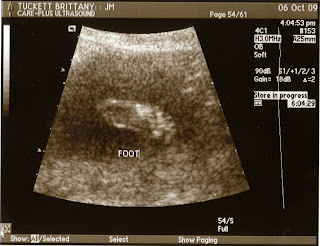 The ultrasound tech said that the baby's head was down and the legs were up. This is a neat picture of the baby's back and spine. This is a picture of the baby's profile. You can't see the outline of the baby's head because it was hidden in the wall of my uterus. You can see the outline of her nose, lips and ear! 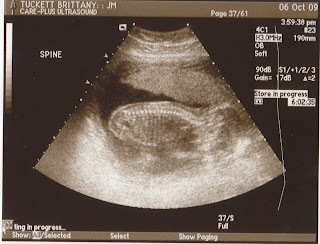 We have a picture of the baby's face but it is a little scary looking and so I didn't want to post it and scare all you! Hope you enjoy seeing these pictures as much as we do! She will look like her beautiful mama of course! oh my gosh, she's so real you know, that's awesome :).